Need a hotel room in Canton for First Monday Trade Days? 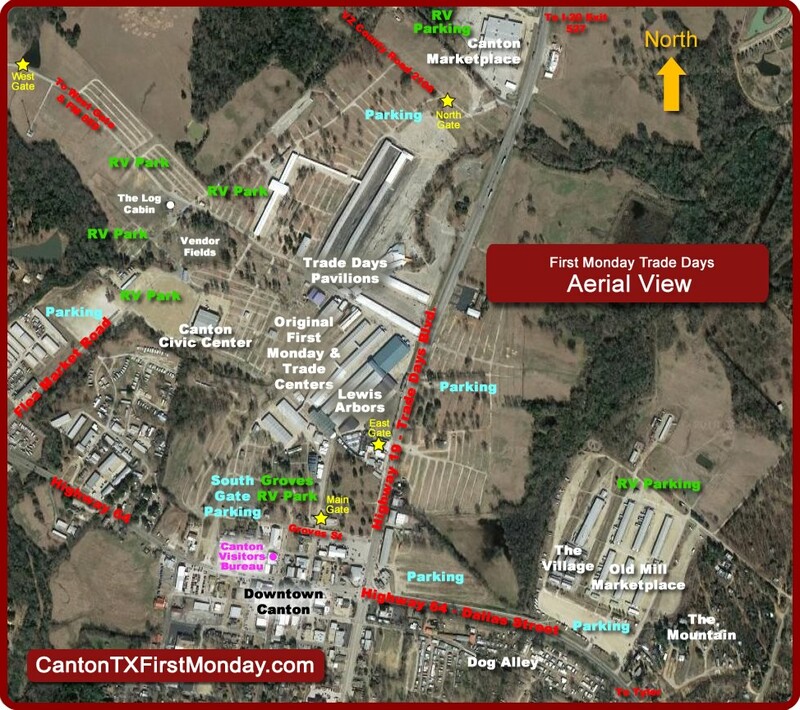 First Monday Trade Days in Canton, Texas is considered the largest flea market in the United States. It is the oldest, largest continually operating outdoor market in the USA, operates on hundreds of acres, and provides spaces for about 6,000 vendors. 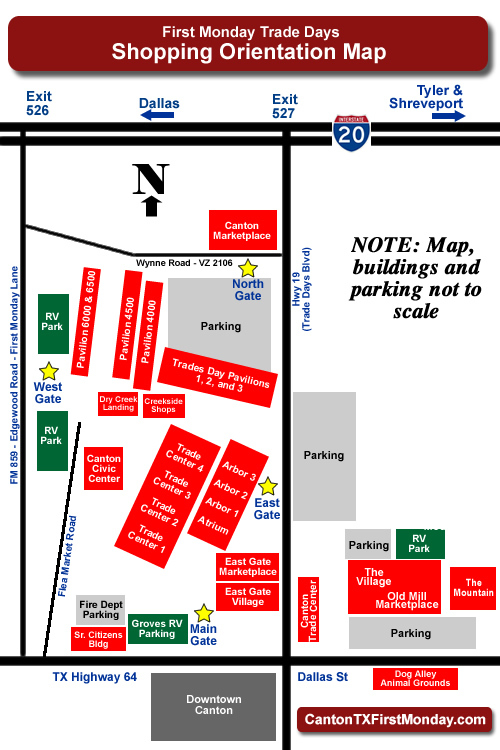 The map shown to the right gives an overall orientation to the First Monday area for new shoppers. And posted on this website is the 2019 schedule of Canton First Monday flea market dates. Access to the First Monday flea maket from Dallas-Fort Worth or Shreveport is via Interstate 20. Tyler is only about a 40 minute drive from Canton. While several exits are available for Canton, most visitors choose to use Exit 527, which is Texas Highway 19, also known as Trade Days Boulevard. 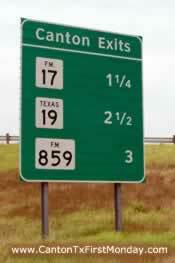 We've included on this website a list of driving times to Canton from Texas cities. Other Canton exits are shown below. Another major east-west access road is Texas Highway 64, or Dallas Street. Canton-Hackney airport (7F5) is located two miles north of Canton, past I-20, and features a 3,800' runway. Pounds Regional Airport (TYR) is conveniently located on Texas Highway 64 east of Canton, and offers commercial jet service. There is generally a small charge for parking. Shopping is what First Monday is all about, and hundreds of vendors offer products from Texas, across the country, and worldwide. Staying Overnight and Shopping Again Tomorrow? 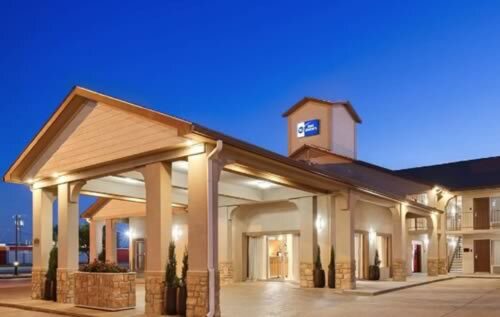 A variety of hotels, motels and B&Bs are available in Canton, Tyler, and several nearby towns such as Athens, Lindale, and Mabank. A number of RV parks are also located in the vicinity. Just like you've heard from your friends, Canton First Monday is Big! First Monday Trade Days in Canton, Texas is considered the largest flea market in the United States. It is big, spread out on hundreds of acres at multiple venues, and offering spaces for about 6,000 vendors. Getting oriented can take a while for first-time shoppers ... but we have included some tips to make you a Canton expert! View our tips for Canton First Monday visitors and shoppers written by experienced Canton flea market shoppers!